A typical news interview is usually cordial and friendly. However, when you enter into a combative news interview situation, it's often tough to stay in control. 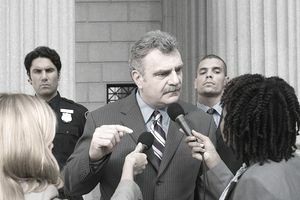 Prepare yourself to remain calm while getting answers to your questions with these news interview tips for handling a combative situation. When faced with a potentially combative interviewee, planning is important. You have to be especially mindful of the questions you'll ask and how you'll conduct yourself if the person becomes rude or won't provide answers. If you are granted a news interview with a politician who's facing accusations of wrongdoing, you'll get better answers if you don't try to play the role of prosecutor. While you can't jump to his defense, you should make it clear that this is his opportunity to tell his side. If you work in broadcast media, these TV interview tips will help you focus yourself on conducting an effective interview, especially if it's a live broadcast with time constraints. Those in print or online media sometimes have it easier, because there's not a camera crew and a lot of equipment to handle besides the potentially difficult guest. Decide what it is you want from this interview. You may seek a list of facts the politician says will prove his innocence, or you may rather have a tearful confession. Knowing your desired outcome will help provide a roadmap for you to follow while the interview is underway. You've planned your questions and what you hope will be the end result of the interview. You should also discipline yourself to listen more and talk less so that your interviewee feels as though he has time to talk. If your interviewee isn't answering the questions the way you'd like, it's tempting to interrupt to get him back on track or to demonstrate that you're in charge. That can be the spark that lights a powder keg of anger if the person thinks he's not being treated fairly. If time isn't an issue, listen patiently to the answer, then redirect your question in a different way. Don't allow yourself to appear frustrated that it's taking several attempts to get an answer. Outward calmness shows the politician that he's not getting under your skin, even if that's what he wants to do. When asking tough questions, look the interviewee in the eye so that he knows you're not embarrassed or afraid of getting answers, even if he's the governor. A polite firmness shows respect for his job and yours. He will go into shutdown mode, not answer anything, and may try to leave the room. Solution: let him vent while keeping him in his seat. Remind him that you're giving him the chance to make his case to your audience, but he has to speak and not waste this opportunity. He will turn into the questioner and ask you your opinion. Solution: If he says, "Don't you think as a journalist that I've been mistreated and deserve more respect?" say that the answer is up to a judge, or voters, and is not your call to make. Responding with, "Let me ask the questions," is likely too aggressive in an already tense environment. He will accuse you of political bias and sinister motives. Solution: Most reporters are well aware of the typical accusations of liberal media bias. As long as you can answer to yourself that you're not being biased, ask him what he means. If he's under indictment, you certainly didn't cause that to happen, the court system did. Mike Wallace, Barbara Walters, and Larry King are three people who built their careers by conducting revealing interviews, including in combative situations. Practicing your skills will pay off for your media career. What are the Types of Print Ads and How Much Do They Cost?